Fixed & many thanks to Robyn Greenlund of Genealogy Trails for her wonderful help in solving this for me. Thank you thank you thank you!!!!! for fixing my browser problem with this web page. Have to remember this. Clicking on the link below will give you access to another picture of this charming older building. 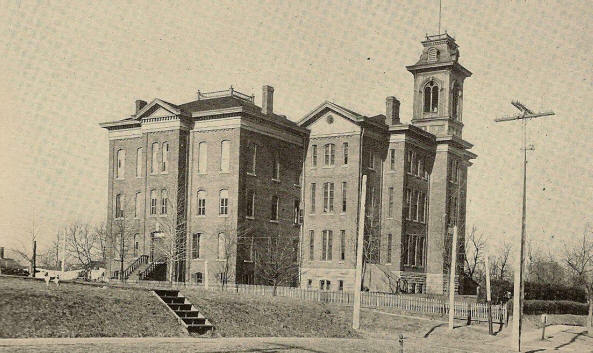 St. Mary's School, Knoxville was opened in April, 1868, in the building of the Ewing Female University, erected about ten years before. For lack of endowment, that institution had been compelled to discontinue its work, and the property was transferred to the Episcopal diocese of Illinois. Of the fifteen trustees, ten are appointed to represents the diocese of Illinois and five to represent Knox County. The Rev. Charles Leffingwell became the founder and rector of St. Mary's, Mrs. Leffingwell was matron for forty years; Miss Hitchcock was vice-principal for over twenty-five years. The school soon outgrew its limited accommodations, and at a cost of about $25,000 it was greatly improved and enlarged. The Hon. James Knox contributed nearly one-half the required amount. On January 4th, 1883, the building and contents were destroyed by fire. 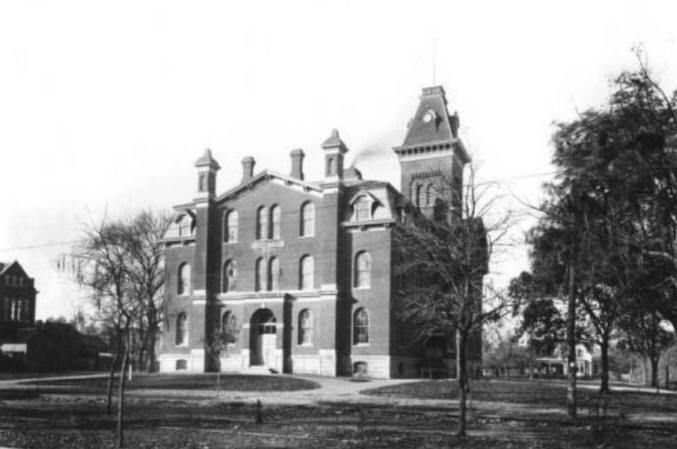 Within a month the school was reopened in the building of Ansgari College, in Knoxville, the few college students finding homes in private houses and reciting in the rooms of the old court house. 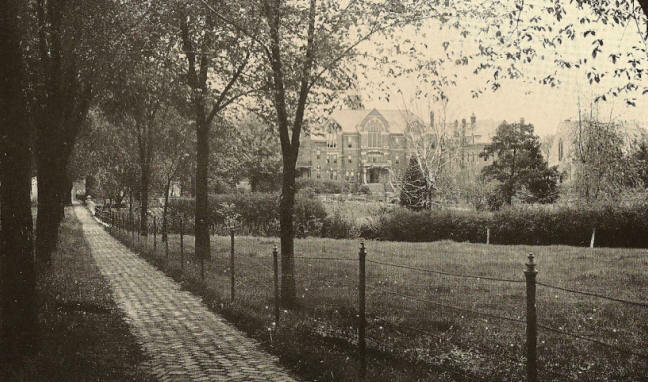 A history of this school should be prefaced by a sketch of another institution of learning, which stood on the same ground and of which St. Mary's was the outgrowth. In February, 1859, a charter was procured from the Legislature for the establishment of an institution of learning called the Ewing Female University of Knoxville. It was named in honor of an old resident of the city. A good, substantial building was erected, and the school was opened and was continued until 1867, when it was closed and the scheme abandoned. It had not seemed to meet the wants of the people, nor to fulfill the expectations that were warranted from the tone of its first introduction to the public. 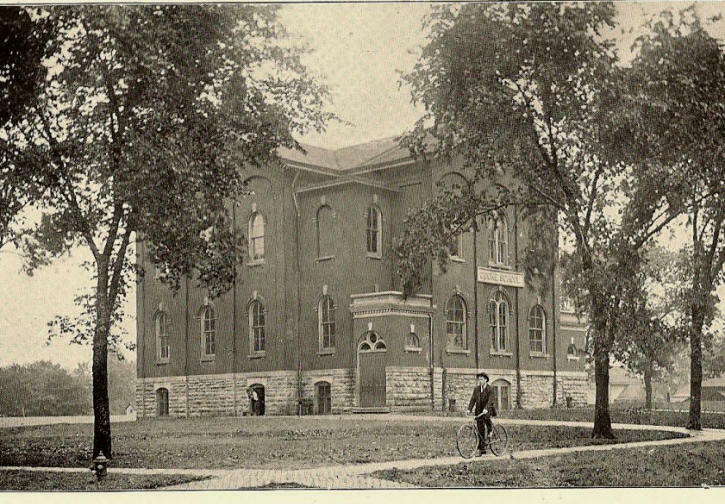 The stockholders of this institution, feeling the importance of having a suitable school for the education of young ladies, tendered this building to the Protestant Episcopal church of Illinois. their offer was accepted and preparations were immediately begun for the opening of a female school under new management. Dr. Charles W. Leffingwell was called to take charge of the new institution as Rector, and it may be truly said became the founder of St. Mary's School. It was opened April 12, 1868, after improving, rearranging and refitting the building. The property was then valued at $20, 000. Dr. Leffingwell began with three boarding and a few day pupils; the building was unattractive, and the institution in a degree unknown. it had yet to make a name and to this end it supporters labored bravely till it stood high among the people, distinguishing itself as a place of ,.earning education, but where their characters would be properly formed, their moral and religious training made a strong point, and where they would be as secure as under the parental roof. All this has been accomplished through the indefatigable zeal and energy of Dr. Leffingwell and his most estimable goodwife, and St. Mary's School, for the educating, refining, and thorough culture of young ladies, has no superior in the West. 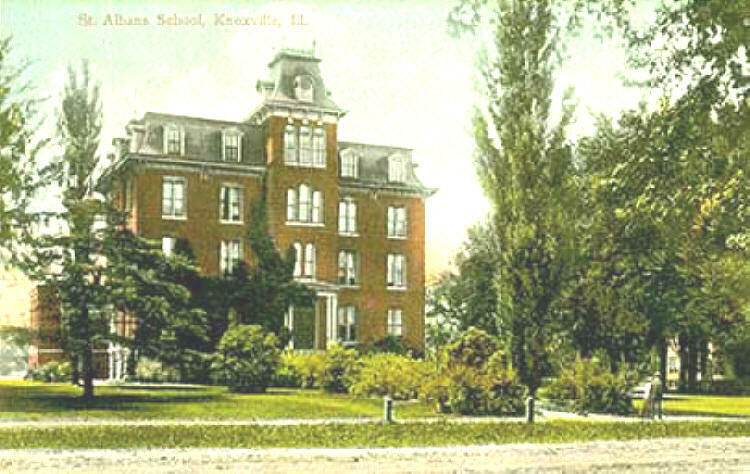 Within four years the school outgrew its accommodations, and received from the late James Knox $10,000 for the purpose of enlargement. In addition to this about $50,000 was expended in building and equipping the school. At the time of the destruction of the school-house with its contents by fire, Jan. 4, 1883, there were 90 boarders and 30 day pupils. The fire broke out about 2 o'clock in the morning, and people rushed to the building, but were too late to save anything or do more than assist in getting the pupils safely out and beyond the reach of danger. All escaped and only two of the pupils were injured, the latter by the giving way of the ladder down which they were descending. The loss by this fire was estimated at $100,000. 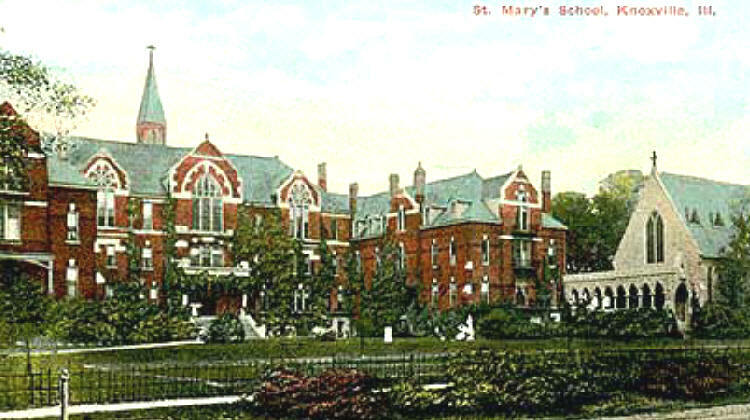 St. Mary's School is an incorporated institution, under the control of a board of fifteen Trustees, representing the three Dioceses of Illinois and the city of Knoxville. The buildings and grounds of the school are valued at $100,000 and a large amount is invested for furniture, school apparatus and machinery for domestic purposes. Ascending the broad steps which lead to the grand entrance of the building, the visitor finds himself in a spacious porch. On entering, he is met by a spacious halls, broad staircases and lofty apartments. On the left are the library and reception room, on the right the office, and beyond that the Rector's study, and these are all so arranged, by means of large sliding doors, as to form one suite of apartments 112 feet long affording a grand opportunity for receptions and other gatherings? All the rooms are, without exception, airy, well-lighted, well-ventilated and exactly adapted to their respective uses. Handsome fresco work adorns the walls and ceilings of the halls, and of the public as well as some of the private rooms. Foxie's note: Wish I could of seen it!!! Returning to the entrance hall, the visitor ascends the broad steps of the grand staircase, which is built in a tower outside the main lines of the building. On the first landing he passes by painted windows, resplendent with roses and morning glories, and at the top of the second short flight finds himself opposite the "Bower," being a deep bay, forming a cozy boudoir, bright with plants and flowers. The recreation hall is a large, cheerful and airy room, 75 feet long, adapted for roller skating and dancing, which, it is hardly necessary to say, are much in vogue after tea. The inevitable piano is there also, to add its ringing tones to the merry sounds of talk and song and laughter. On the same floor, and occupying the northeast angle, is the studio. In proximity to the studio is the magnificent study hall, 40x80 feet and 18 feet high. Adjoining the study hall, on the same floor are recitation rooms, toilet and laboratory. In the basement are located the dining room, kitchen, laundry, etc. some idea of the heating apparatus may be conveyed by the statement that there are four large boilers at work, night and day, sending steam through more than five miles of radiating pipes. Nearly 600 tons of coal are consumed during the year, and the entire building is kept at a pleasant temperature in the coldest weather. The aim of the Rector has been to provide the best advantages for intellectual training, combined with social culture and Christian influences. The exercises of the school are conducive to habits of order, promptness and self-reliance. The pupils are under the direction of the teachers in dress, habits, manners and conversation, as well as in their studies, Also to the health of the pupils the most careful attention is given. All are required to exercise in the open air and within doors. A skillful physician visits the school each day, and with experienced matrons, has constant care for the health of the household. The household arrangements are homelike and pleasant. Pupils are received into the family and cared for as children, with kind attention to their comfort and happiness. Besides the daily association of pupils and teachers, there are special meetings on Friday and Saturday evenings for sewing, reading, conversation, music and other recreations. The grounds, which are located only a few hundred yards from the depot, embrace four acres. They are beautifully located, ample, artistically laid out, and adorned with flowers and shrubbery, giving the whole quite a luxurious and homelike aspect. 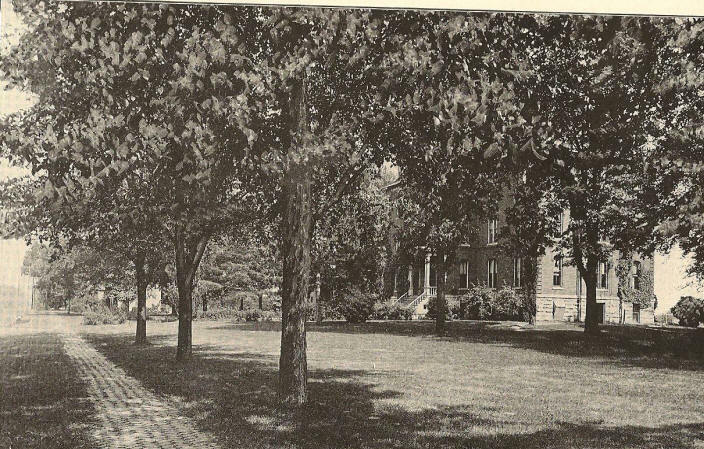 In the center of these grounds the school building up rears its stately head. It is an imposing structure of gothic style of architecture, and was designed by Dr. Leffingwell, which accounts for its complete construction. The accompanying full-page lithographic view of the building, chapel and surroundings shows the beautiful architectural design and harmony of each structure. Rev. Charles Leffingwell, D. D., Rector and Founder, Metaphysics and Elocution; Rev. Edward H. Rudd, M. A. Chaplain, Latin, Natural Science, Mathematics; Rev. William B. Morrow, Mus. Bac., Sacred Music; Nancy Meneely Hitchcock, Vice-Principal, German, Rhetoric, Literature; Mrs. Rudd, Teacher of History; 'Harriette h. Post, English Branches; Mlle. Jeanne Bouvet, Teacher of French; Carl Laux, Professor of Music; Carrie M. Atkins, Assistant in Music; Sophia M. Chase, The Study Hall, English Branches; Ellen Dewey, The Studio, Arts of Design; Carrie B. Castle, Assistant in Studio; Blanche Smith, Vocal Music, Charles Lindoft, Violin and Cornet; M. A. McClelland, M. D. Visiting Physician; Mrs. Leffingwell, Matron; Louise S. Nichols, Assistant Matron; John F. Somes, Curator and librarian. 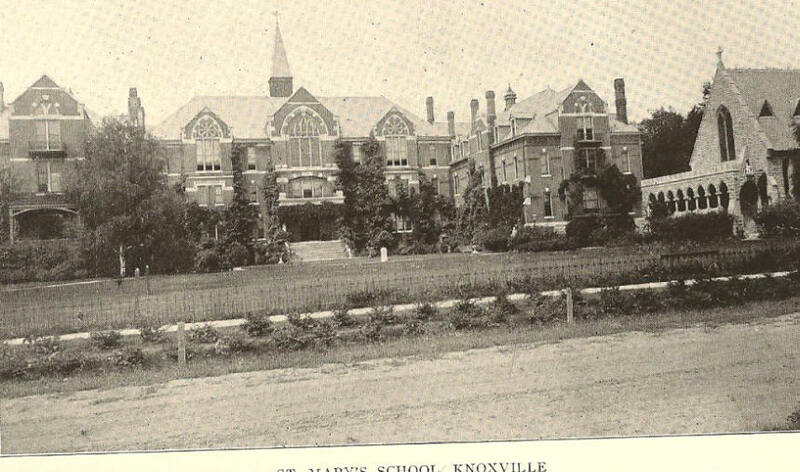 St. Mary's School, Knoxville--- established in 1869. 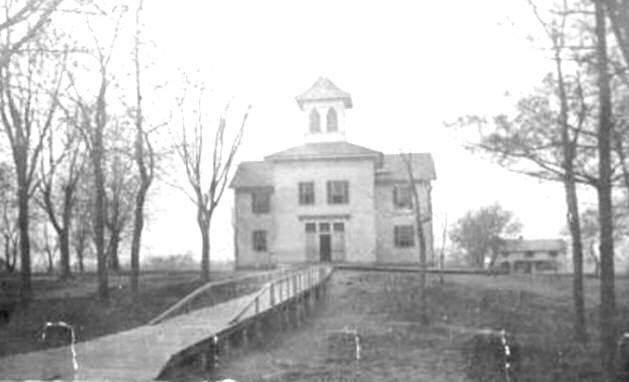 First building erected for Ewing Female University in 1860/ Remodeled in 1873, Again in 1883. Destroyed by fire in 1883. Rebuilt immediately. Recreation Annex built in 1901. 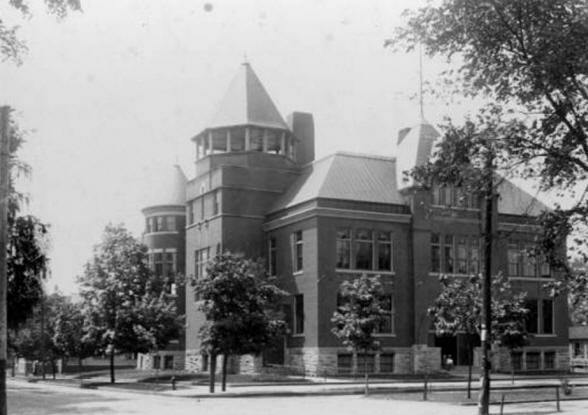 The picture above is of the Ansgari College, the property having been reverted to the city of Knoxville. To first tell the story of this fine old building which now nothing stands on it property in the city of Knoxville. They finally tore it down; but you also need the history of the Ansgari College. Ansgari College--- One of the objects of the founders of this College was to provide for the education of the Swedes, who formed no inconsiderable part of the population of this and many other of the adjoining counties. 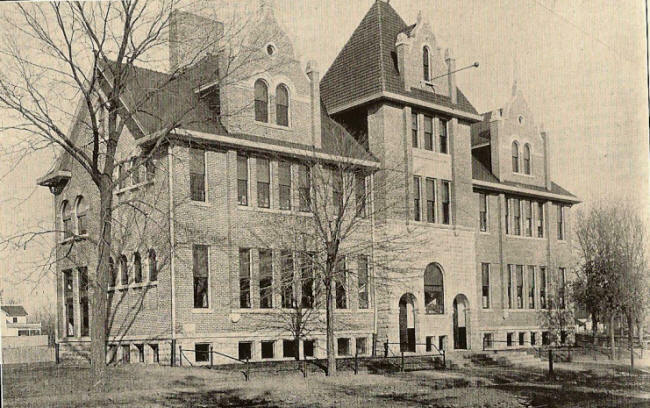 It was the out growth of a school known as the "The Mission Institute," of Keokuk, Iowa. That school was first opened in 1873, in a chapel in that city. In 1875, Prof. Chas. Anderson, the Principal of this school, and subsequently the President of Ansgari College, made a visit to several localities, with a view to securing a suitable location on which to establish a school. While on this tour, he fortunately met with Hon. James Knox at Knoxville. After explaining the purpose of his visit to Mr. Knox, he was informed by the latter that he had long desired to establish and institution of learning in Knoxville. These t3o gentlemen were not long in forming their plans. Prof. Anderson was very much pleased with the location of Knoxville, and m ore so with the splendid donation of that philanthropic gentleman, Mr. Knox, who agreed to donate immediately $10,000. He subsequently increased this amount by about $3,000. Other donations were made, and on July 03, 1875, tow months after Messrs. Knox and Anderson had met, ground was broken and the construction of the college building commenced. 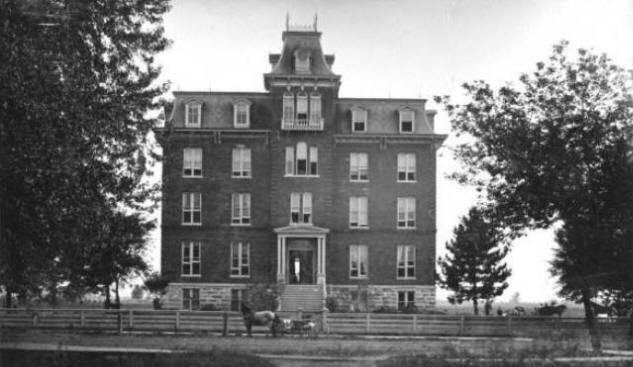 By Aug 1, 1876, the edifice was completed. t he building is a four-story brick structure, with a mansard roof and a stone basement, 74 feet long by 44 feet wide, and contains 39 rooms. It was built and furnished at a cost of $22,000. The architecture is modern, well proportioned, and the building presents a fine, imposing appearance. It is located on a plat of four acres of ground on East Main Street. It is conducted in the interest of the Evangelical Lutheran Church, and is both secular and religious in its course of instruction. The collegiate course occupies four years, the theological and academic course two years. The first Faculty was Prof. C. Anderson, Rev. J. Anjon, Rev. J. A. Lowe, and Miss S. Larkee. It contained a fine library of 1,000 volumes, which was furnished by the ladies of Knoxville. The original Trustees were: Hon. S. H. Tompkins, President of the Board; Rev. Chas. Anderson, Secretary; D. M. Eiken, Treasurer; P. H. Sanford, J. H. Lewis, C. A. Linstrom, J. s. Holmes, A. Nelson, A. N. Anderson, Rev. J. Anjon, Lewis Palmquist, S. Peterson, Geo Larkee, J. P. Lawson and P. Mattson. This College did not prove a success, and a few years ago it was closed. 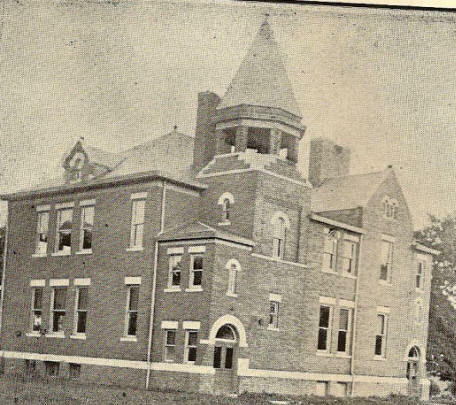 Recently the building has been leased by the Evangelical Lutheran Church of the united States, and a school is to be established here to be called the Knoxville Academy and Normal Institute. It is to be changed from Ansgari Synod to the Augustina Synod. It is expected that the school will be opened by the 1st of September, 1886. Now comes 1890 when it is to be St. Alban's School. Do not know if it ever became the school which is mentioned above or not. If it did it did not last long as this about 14 or 15 years later it is another school. 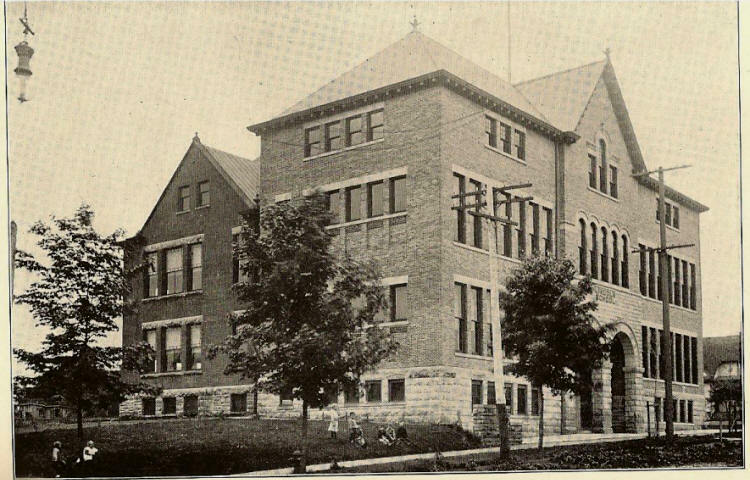 St. Alban's school for boys, Knoxville, was founded in 1890 by the Rev. Dr. C. W. Leffingwell, and for several years was conducted under his supervision. The property of Ansgari College, having reverted to the city, by the discontinuance of the Swedish school there, was transferred to Dr. Leffingwell, and by him was greatly enlarged and improved. Mr. Lucien ?F. Sennett is the present headmaster and lessee of the school, and under his capable management the institution has steadily advanced in numbers and in efficiency. The maximum number of students in residence is now sixty and there are some day scholars. You may also find more information at this web site on St. Mary's School and St. Alban's. We are pooling our information together. I appreciate your help on this project very much! P.S. I found information about St. Margaret's School as well on the city of Knoxville's site and listed them along with St. Mary's since they both educated high school-aged girls, but I have not found evidence that they both were connected or if they had high school curriculums at the same time. I found a photo from their site and have linked their site to ours thru the picture. In a recent discussion with another fellow researcher here is another little bit of tidbit I have learned about the schools. The older school houses were of big dimensions but only had four rooms. Thanks Paul for this information. I add it here at the beginning of these older famous schools. I have been reading WL Steele's book. I just got to the part about the remodeling of the schools. 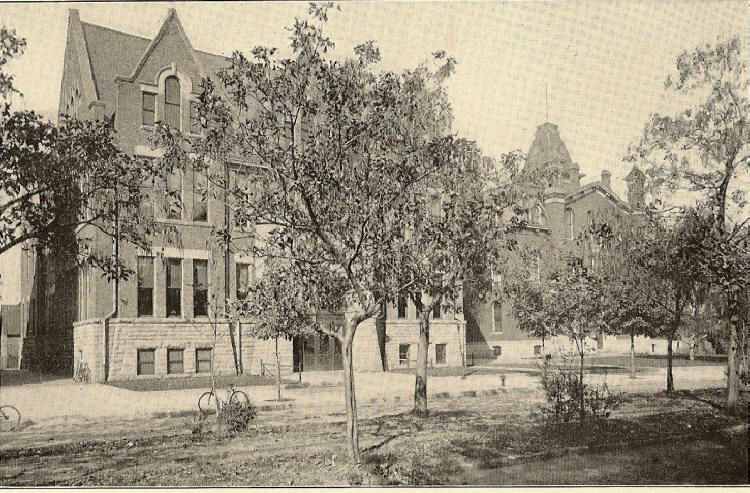 Up until the 1893 all of the Ward schools only had four rooms. After a few grades students would have to travel to the central part of town to attend school. Because Galesburg was increasing in size the school board decided to increase the size of the ward schools allowing students to attend them until they were ready for high school. Hitchcock was the first to be remodeled in 1893. An additional five rooms and an office were added and the toilet was broad into the building for the first time. Weston School was the next to be enlarged with nine additional rooms, an office and an auditorium, it too got an indoor bathroom. The other schools were also enlarged eventually. Enlarging the schools also fit with the self imposed goal of reducing class size to 40 or 45 students. Some class sizes had soared to 60 students. I doubt there were teachers aides back then. You can find this account starting on page 114 of Steele's book. Lincoln School-- Named for Abraham Lincoln; located on corner of North and Pearl Streets. A nine-room building with auditorium, remodeled in 1901. LOCATED ON SOUTH Broad, between Simmons & Tomkins, Central a twelve-room building erected in 1903. Value $30,000. Churchhill a twelve-room building erected in 1866, Partially remodeled in 1896. Value $63,000. Named in honor of Prof. George Churchill of Knox College. Located on corner of North Cherry & Selden Streets. A nine-room building, remodeled in 1890, value, $25,000. Named in Honor of Henry Hitchcock, Supt. C. B. & Q. Ry. 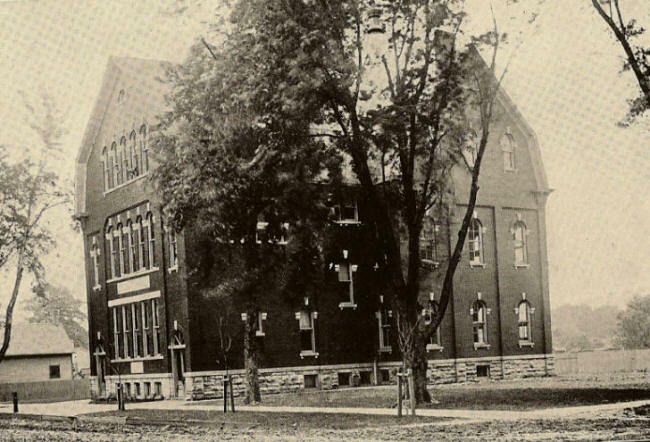 Named in honor of Dr. Weston, President of Lombard College, located on corner of Mulberry St. & Allen Ave, 13-room building, remodeled in 1895. , it still stands today and was recently used as private Christian school until they moved out on East Fremont Street. Named in honor of Stephen A. Douglas, located on corner of S. Seminary & 3d Streets, 6-room building with auditorium remodeled in 1902 value $20,000. Okay--- when I get the proof I need I will put here. 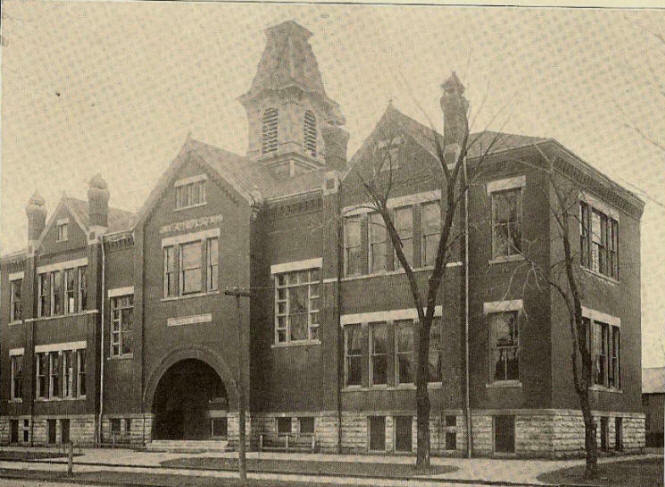 The building pictured above never stood on the corner of Maple & Losey Ave. there was however, a Bateman school there before this building here was built or already there and made into what was known as the Bateman school. 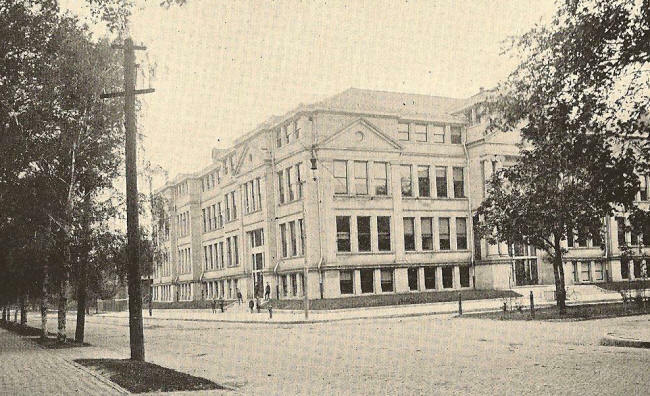 The original Bateman school stood on the corner of Maple & Losey Street and wasn't this big. In the early 1900's as the population was growing they re modeled alot of the four room schools originally built. Farnham school was one of them the picture of Farnham school pictured on this page is not what is left of the Farnham school. it had a whole story added to the top of it I have access to the original plans of the school. But I knew this building could not of been on Losey & Maple streets the corner of and then moved to it's present location and later torn down. thanks. Situated on the corner of Broad and Tompkins Streets Dimensions, 128 x178 feet, containing 41 rooms with a study hall, 82�x104� feet. Seating capacity, single desks, 800. Built in 1905. Cost approximately, $125,000. It is now gone too. what a wonderful & beautiful old building it was. Electricity in this photo and a little doggie on the left, some differences than above postcard photo. Located on corner of South Academy & Knox Streets, erected in 1878-9, convent contiguous to Academia, erected in 1880-1, value $30,000, Catholic school for girls. The frame building pictured on the school's page that's labeled Altona Grade and High School was not Kufus School. 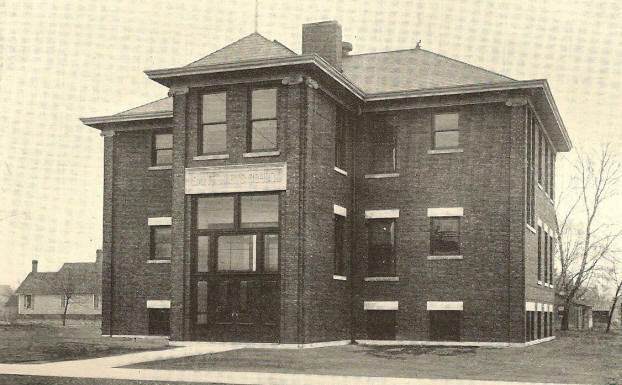 Kufus School, a substantial four room + gym+office+band room brick building, was built in 1917 and named after Mary E. Riner Kufus, who was the biggest contributor to the building's construction costs. 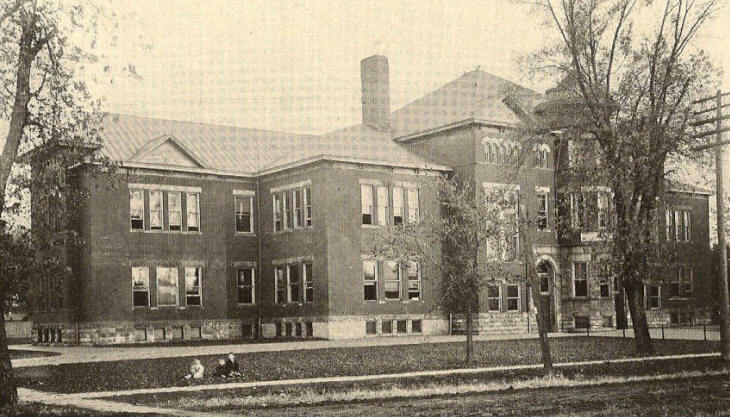 Kufus and the "new" Walnut Grove Township High School building, constructed in 1916, replaced the old frame building. Kufus was constructed on its site. I attended Kufus for four years shortly after the ROVA district was formed. The old high school building became the grade school when I entered fifth grade. Kufus served briefly as a community center and was then torn down, a real pity because it was a nice old building, very typical of small town 1-8 grade schools. Interestingly, when I was a kid, the house shown in the background of the old frame school building still stood---and, in fact, was inhabited. I think it may actually still be standing, unlike the school itself. I do wish our small towns could see their way clear to recycle and reuse the old buildings. They had character and were frequently much better built than what got put up to replace them in the mid-twentieth century. (Foxie's note: I couldn't agree with you more. & the house in the background is still standing when I lived there I knew the people who lived in it they are both gone now but very good people.> Thanks for the information. I'm afraid that I don't have any pix of Kufus school. I wish I did. 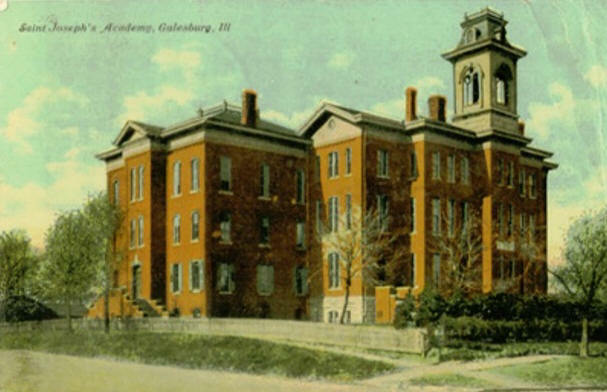 My first grade teacher, Katherine Stuckey, took up art after retirement and drew many pen and ink sketches of the building. She taught there for her entire career. I knew Katherine too, she was a wonderful lady... Unfortunately, her family is scattered to the four winds now. I think the farm was sold when she died. Her daughters had moved out of the area. Are you aware of a website called "Illinois Glory Days? ", yes I am, --- It collects pictures and information about the high school districts that are no more. I've spent many hours exploring their site which they add to regularly. You know, I bet if one put a note in the Altona (Walnut Grove) High School entry asking for Kufus pictures, you might get somewhere. Or contact the alumna association which I believe still functions. Kufus was a really fine building, with lovely woodwork, a gym and stage in the basement, and a "proper" raised principal's office up half a flight from the main floor that had a panoramic view of the playground. The problem with the building was that it had been built on the assumption that each room would hold two grades, an idea that fell from favor in the 1950s so they didn't have enough classrooms to continue in the building without adding on . It was easier to move us to the old high school building. There was one anomaly about the site which may also have contributed to the idea of moving the school across town. Kufus sat on the top of a small hill, the highest point in town. The hill (and the building) were regularly struck by lightening. The building, of course, bristled with lightening rods, and at the slightest sign of a storm all the kids were herded inside. I can remember standing at the window of one classroom during a particularly violent storm watching lightening strike all around. There were little craters scattered across the school grounds from the strikes that had occurred over the years. Schools & Academy's many many photos takes 8 min dwnld ovr slw net connect. but worth you'll see!!! !